MISSION VIEJO, CA--(Marketwired - Oct 1, 2015) - TeamLogic IT continues to expand its nationwide market penetration by targeting vehicle-fleet operators for its industry-leading managed IT solutions. Business-to-business services, such as courier lines or fleets of delivery vehicles, operate on computerized dispatch systems. So do consumer-facing operations, such as limousine or emergency vehicle services. They all use state-of-the-art, precise electronics that include a centralized dispatch server, GPS-enabled PCs or tablets in the vehicles, and specialized software to track the entire fleet. communications with drivers. The hardware behind them is robust, as well, requiring frequent adjustments to keep up with the large amounts of memory these software platforms require. "The whole world of dispatch is reliant on technology to operate now," said Chuck Lennon, President of TeamLogic IT. "If any portion of that fails, their entire capability to dispatch comes to a halt. For a limo driver, that is an inconvenience. For an ambulance driver, it could be a matter of life and death." As a top-rated technology franchise, TeamLogic IT stands ready solve major headaches for small and medium-sized businesses by offering managed IT service solutions that turn technology into an ally rather than an obstacle for clients. The fast-growing franchisee network meets a universal need among today's businesses for rock-solid IT solutions that prevent downtime and provide security for critical data. just called in when something goes wrong. They have spent time getting to know the dispatch business in many different markets, so in addition to providing on-the-ground services and support, they also can consult with other owners and technicians if they hit a particularly complex challenge. "What we tell dispatch-oriented companies is the same thing we tell any other business," Lennon said. "TeamLogic IT doesn't give them 'break-fix,' one-off services. We want to learn their operations from the ground up. That way we can provide valuable insights -- not just on what they have, but on what they need to continue growing and being profitable." probably the ones who installed it, and we are definitely the ones who've maintained it. If we need help, a nationwide network stands at the ready. It's impossible to overstate how important that kind of support integration is, and it's why TeamLogic IT continues to grow not only in terms of franchise locations, but in industries we serve and support." To learn more, visit www.teamlogicfranchising.com. 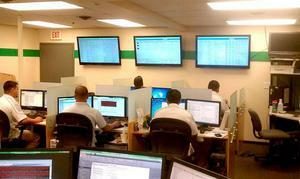 Dispatch services rely on complex IT to keep their operations running smoothly. Managed IT solutions from a TeamLogic IT franchise can help. TeamLogic IT provides companies with a wealth of services to keep their technology in optimal shape.